Whether you’re moving into a new home or you’re simply moving old furniture out and new furniture into your home, you should take precautions to protect your carpet. 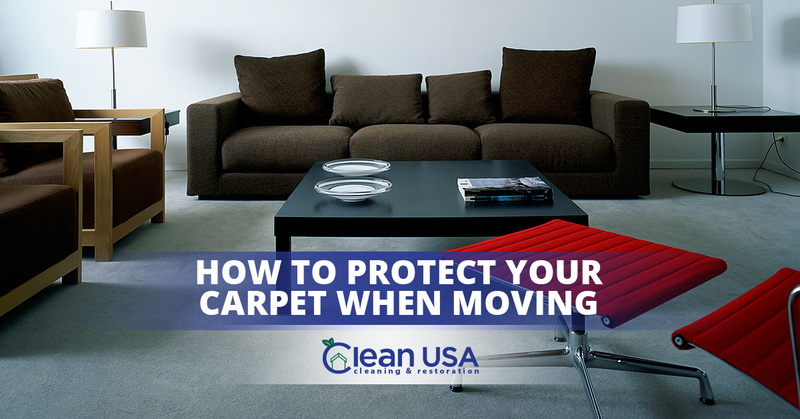 Here at Clean USA, our home carpet cleaners have some of the best tips and tricks to keep your carpet protected from wear-and-tear, along with dirt and stains that can plague carpet when moving occurs. If your carpets do happen to need a good deep cleaning after moving things into your home, you can count on our home carpet cleaners in Sycamore to refresh and restore your carpets. Protecting your carpets when you move things into your home can keep mud, dirt, and wear-and tear from wreaking havoc on your home’s carpet when it comes to both look and feel. The tips below can help you to ensure that your home’s carpet won’t suffer when it’s time to move things into your home. #1. Use a film carpet protector. You can purchase a film protectant to place on your home’s carpet if you’re going to be moving a lot of furniture into or out of your home. The film protectant will not only keep dirt and mud from getting on your carpet, but it can also help to protect the carpet from the wear that high traffic can create if you expect multiple trips will have to be made into your home. #2. Put towels or mats down at the entrance to every door. If you’d rather not purchase a film protectant to run along the pathway of the carpet that will be walked on when you’re moving things, you can instead place towels or mats at the entrance of every door. This will at least help to catch most of the dirt and dust that could be tracked into the rooms that you will be moving things into. #3. Put cardboard down on high-traffic pathways. Another option for protecting your floor in high-traffic areas is to simply place strips of cardboard down to walk on. This may be a cheaper option that purchasing a film protectant if you only need to protect a few areas of carpet or flooring. However, you might want to consider using cardboard in addition to a protective film, if you’re expecting a lot of heavy-lifting to be done in the high-traffic areas. People tend to shuffle their feet a lot more when they’re lifting heavy furniture or boxes, so the protective film may not hold up well under that kind of traffic. #4. Supply movers with shoe booties. One way to ensure that you can keep dirt, mud, and the rough bottoms of shoes from wearing on your carpet when items are being moved in your home is to ask movers—whether that be friends, family, or professional help—to wear shoe booties that you can provide for them to slip over their shoes. Even if the movers will be going in and out of your home multiple times, having booties on their shoes can still help to prevent some of the wear that shoes may cause on carpet. If you move things into your home and your carpet does happen to get damaged, know that you can call Clean USA for the home carpet cleaners in Sycamore you can trust to restore your home’s carpet. Whether your home’s carpet has suffered due to stains, dirt, or losing volume from the traffic on your carpet, a nice, deep cleaning can go a long way in returning your carpet to a like-new appearance. Schedule your home carpet cleaning with Clean USA today!